Uglyworld #1747 - Lifewaters - (Project TW - Image 324-366), a photo by www.bazpics.com on Flickr. Baz was tellerings me that my lacks of sleepies in the lasts coupler of days is downs to me drinkerings so much Mountains Dew. 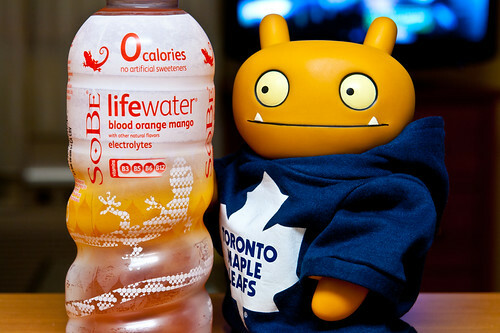 He suggestereds that I trys his favouriters kinds of waters drinkies over here in Americas, calleds Sobe lifewaters, and lets me tell you it may not be fulls of bubblers but it is damns tastiers! You may also noticers that it has Mango flavourings insiders of this bottler, justs the perfecters blend of fruiters for me!